As you will no doubt agree, in every working environment, space is at a premium. And obstructions to smooth operations are not an option. So it is vital that your technology helps, rather than hinders, the way your business works, delivering the premium performance and space saving design you demand. The KV-S1037 Series compact scanners deliver both in abundance, offering scanning versatility that outdoes anything else in this scanning category. While both models in the series now feature USB3.0, the KV-S1037X also offers a built-in Gigabit Ethernet and IEEE802.11b/g/n WiFi, allowing you to connect directly to other devices without the need for cables. The KV-S1037 Series scanners could not be easier to operate, thanks to single-touch scanning. You simply press one of the three preset buttons to scan and send the data to defined destinations. You do not even need to touch the scanner to operate these devices. For convenient manual paper scanning, you just insert your document directly into the ADF to start the scan. With Panasonic Image Capture Plus technology, you can transfer scanned data to a PC in an image format. This means you can edit, switch or delete pages via a thumbnail interface. It also allows you to manage complicated scanned documents and file them easily. 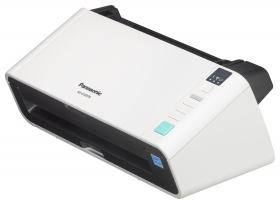 With these compact scanners, you can eliminate the possibility of problematic scan settings. An integrated auto preview function automatically adjusts whatever is scanned, offering nine possible candidate types. You can then select the most suitable image with a single click, making any further adjustments that might be required. So there is no need to waste time going through a trial-and-error process and highly legible electronic documents are produced, quickly and easily. Also, to save you time and effort, an auto rescan feature allows the user to adjust the image on a PC screen without rescanning the original document.